If my human came in to an awful lot of money, he would probably want to build a house. If he asked me, these are some things I would want to have. I like high places. 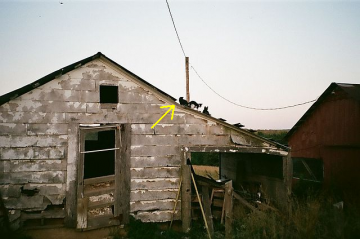 Both here and the other place where we lived had kitchens where I could sit on top of the cubbards. (Some places the cubbards go all the way to the ceiling and that's not good.) I also like to sit on top of the fridge, but he doesn't like it that I have to climb on the stove to get there. He does let me sit in the box on top of the fridge, however. 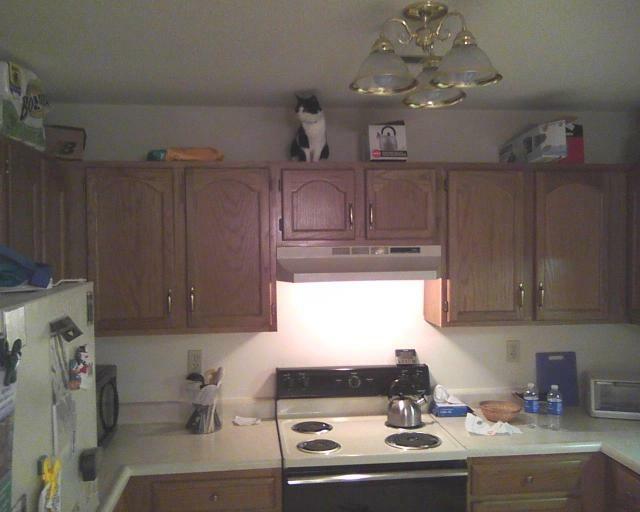 I have one shelf I can jump to, and a couple others where I can jump on his back to get there. He usually helps me get there. He tells me he has seen some homes where there are kitty highways where the cats can climb up the shelves on the walls and walk across the catwalks (oh , that's why they're called catwalks ). In the shed, I climbed up one of the supporting boards to the shelves. One was about eye-level for him, and another was above the height of the door. There was an upper window out front, and a back window, but we kitties couldn't look out of it. I tried (or was it some other kitty? my human doesn't remember ) to get up to the top of it one day without success. I like windows. (Some of these windows can also be high places.) I want to be able to watch my neighborhood and see where those birdies I can hear are. I also want to be able to see if there are other cats in the neighborhood, and if my human is giving them too much attention. 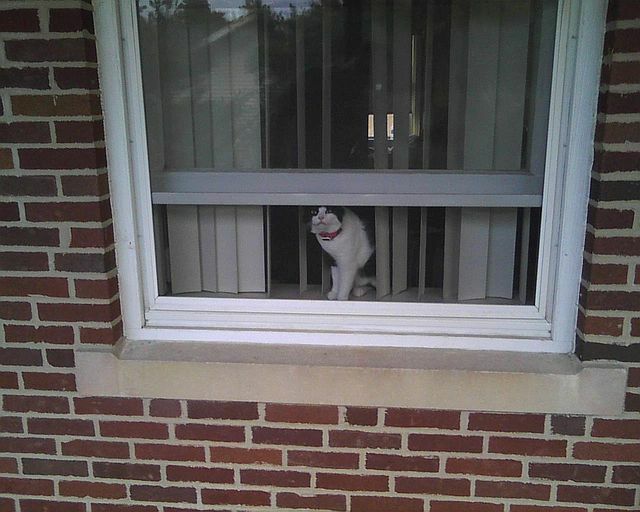 I also like it when I can see my human coming home. 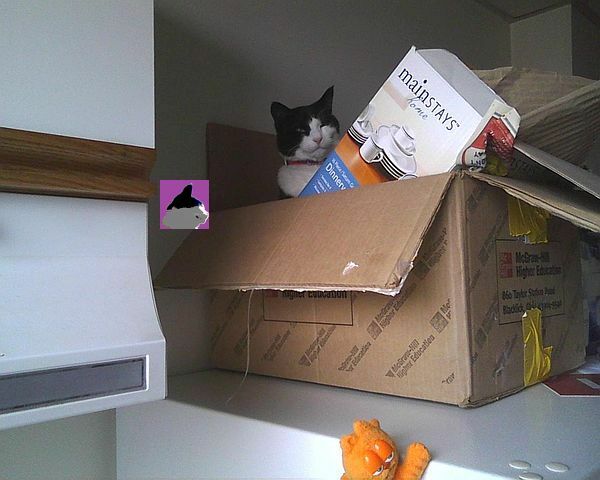 The front windows are frosted, so he had to build me a tower out of boxes so I can look out and see where he is. When he opens the windows, I get fresh air and can see more, too. But sometimes I get rained on if they're open and it starts raining. Windows often have sunny spots, but not so much here. We don't have any east or west windows, and there is a big overhang on the southern side, so we don't get much son there. I mean sun. About the only time I get sun is early in the morning or late in the afternoon in the winter, and we're closer to the equinox now than we are the solstice. 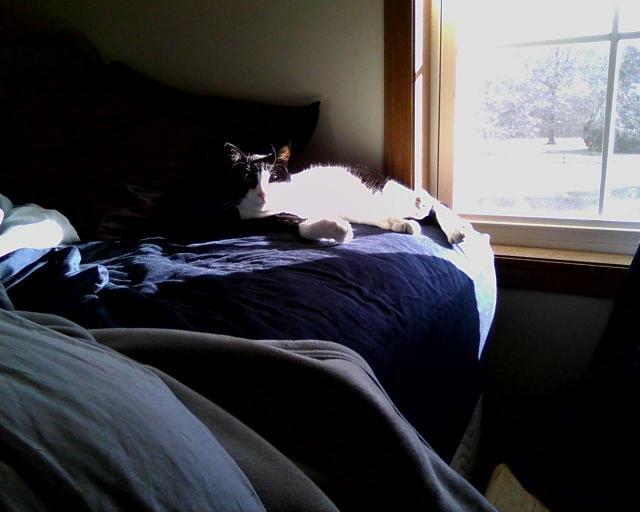 There is a sunny spot in the room where we stay when we visit the farm. I also might like to have a hall where I can run up and down the hall. It's easier to chase a ball that he throws down the hall, and there's a definite run. We had a hall at the old apartment. 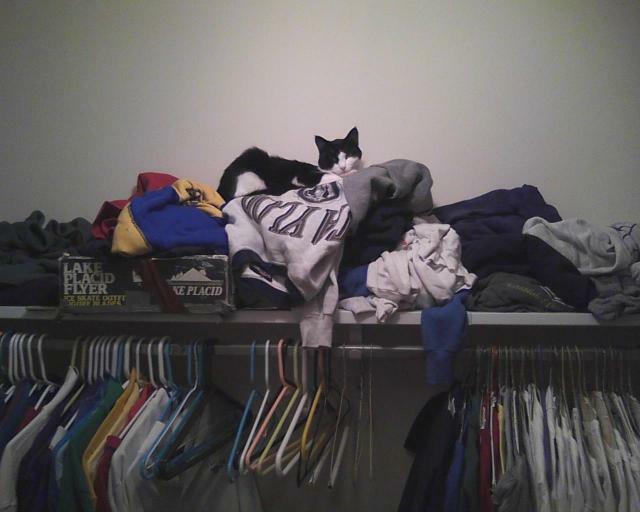 I like big closets, where there are lots of places for clothes. Oh, and lots of places to hide. That's not as important for me as it would be for my mother, or my sisters when they were still looking for places to have kittens. I think I'll post my outside part of the dreamhouse in a separate post.